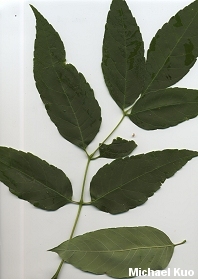 Bark dark grayish brown, deeply cut into X shapes; leaves compound, with 5-9 candle-flame-shaped leaflets; leaflets with whitish undersides; twigs and samaras distinctive (see below); growing east of the Great Plains. Habitat: Varied; surviving well in several different forest types; fond of moist soil, but able to survive elsewhere; growing east of the Great Plains. Stature: 50-80 feet high; to 3 feet in diameter; with an open crown. 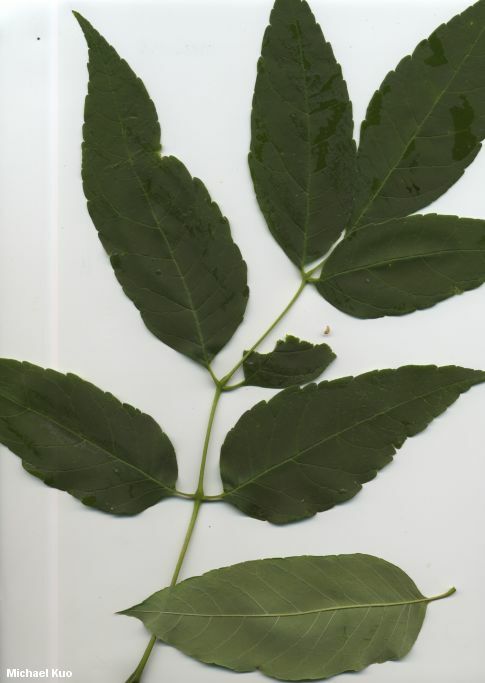 Leaves: Compound; composed of 5-9 leaflets arranged more or less in pairs, with a single leaflet at the end; leaflets dark green above and whitish to greenish below, candle-flame-shaped; edges slightly toothed or nearly smooth; stemlets to 1/2 inch long. 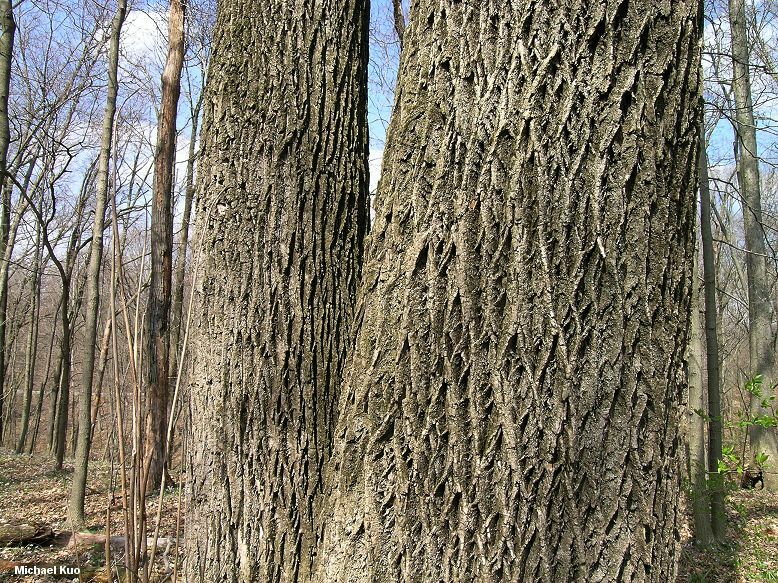 Bark: Dark grayish; deeply cut into X shapes (or "diamond" shapes, depending on your perspective). 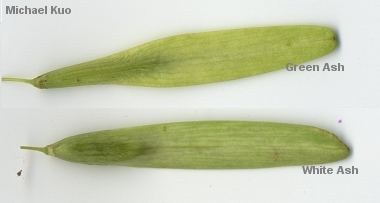 Fruit: A small samara or "wing" 1-2 inches long; hanging in dense clusters; the hard, seed part not extending far into the flat, wing part (see below). 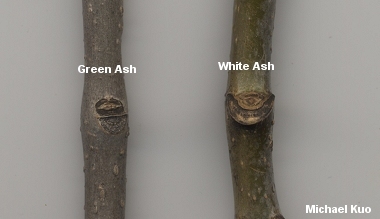 When samaras, twigs, leaves, and stature are considered together it is usually possible to make an identification--but the features do seem to intergrade between the species sometimes, making precise identification difficult. Some authors emphasize the extent of the serrations on the leaflets, but I find this character unreliable. Gyrodon merulioides is exclusive to ash. Black morels and yellow morels are frequently found under ash. Perenniporia fraxinophila is an ash-loving parasite that causes severe heart rot.